Bear Creek Elementary Library is inviting students to participate in the first annual literary peep-a-palooza. Students are invited to create dioramas based on their favorite book or literary content using peeps and their imagination. These dioramas will be displayed in the library for the school to view. All students are invited to participate, however, the first 65 students who sign up will receive a PTA peep-a-palooze bundle including a package of peeps and cardboard box to get started. Boxes and peeps will be distributed to the first 65 students to sign up on April 4th and 5th and all completed dioramas should be brought to school and turned into the library for display by April 22nd. 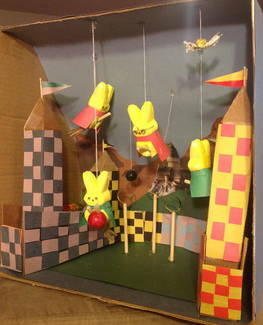 You can find examples of Peep dioramas using Google.